 A marching parade started off at the National Sports Institute (NSI) all the way to the Goroka National Park.  Delegates from 15 of the 17 Districts (New Guinea Islands and Siassi had not yet arrived) of the Evangelical Lutheran Church of Papua New Guinea (ELC-PNG) gathered at the NSI field and were led by the host, Goroka District to the National Park where the official opening of the 28th ELC-PNG Synod took place.  Among those who assembled for the procession were Trumpet Groups, Delegates from the 15 Districts of ELC-PNG, lead by their respective District Presidents, The Head Bishop, The Assistant Bishop, The General Church Secretary, The ELCPNG Department Heads, People with Disabilities and members of the host district and the general public.  The Highlands Highway came to a complete standstill while Traffic Officers controlled vehicles and the general public as the delegates and officials made their way to the National Park.  Morobe Governor Hon. Luther A. Wenge, Member for Finschhafen Hon. Theodore Zurenuoc and Member for Henganofi Hon. Pherao Orimiyo arrived with the delegates and officials an hour before the official program began. 3. Representatives from Business Houses, who showed support in cash and kind. 4. 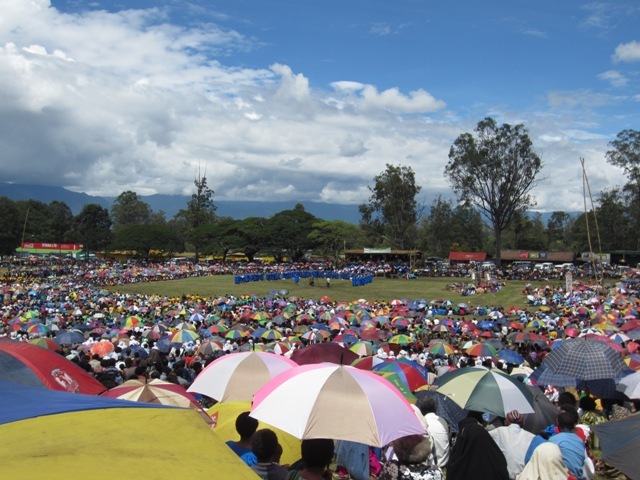 General public of Goroka town and the Eastern Highlands Province. 6. Prime Minister, Hon. Peter O’Neill and other Parliamentarians namely; Member for Bulolo Hon. Sam Basil, Member for Lae Hon. Bart Philemon, Member for Kabwum Hon. Bob Dadae, Member for Obura-Wanenara Hon. John Boito, Member for Unggai-Bena Hon. Benny Allan, Chief Secretary Manasupe Zurenuoc, Chief of Staff of Prime Minister Mr. Ben Micah, Chief Secretary of the National Government all arrived later during the Worship Service.  The Bible Text for the day; Romans 12:1-2 was read by Mr. Martin, a Teacher at the Special Education School at Mt. Sion who graduated from the University of Goroka in 2008; Mr. Martin is a Person with Disability of sight.  Sharing of the Word came from the The Head Bishop Rev. Giegere Wenge. He titled his sermon “STRESS” and was based on the theme of the 28th ELCPNG National Synod bible text; Romans 12:1-2. Rev. 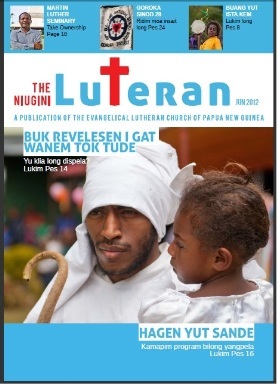 Giegere Wenge encouraged ELC-PNG to practice the habit of giving as the Church has been lacking the practice of giving for so long.